After seeing the soft pretzel recipe on Flourtraders blog, I was struck down with food envy. It reminded me of having massive cheese pretzels in America and I suddenly had a craving for them. Carrying on my love of mustard, I couldn't resist the addition to the savory pretzel and thought it would be perfect with cheese as well. I also really wanted to somehow get cider in there, but decided it might end in disaster so came up with the cheese and cider dip. This was one of those recipes where you just add some ingredients that you think might work and hope for the best, luckily they came out soft, doughy and tasty! Start by combining the yeast with a tsp of sugar and 3 tbsp of warm water and leaving for ten minutes. Cream together the butter, mustard and cheese. Mix the flours, sugar, salt, and butter mixture together with your finger tips to make bread crumbs. Make a well and pout the yeast mixture in, then mix together. Keep adding small amounts of water and mixing until it forms a firm dough. Knead the dough for 5 minutes, then put in an oiled bowl covered in cling film to rise in a warm place for an hour. When risen, chop into 8 equal pieces and roll in to very long thin pieces. Fold them into a pretzel shapes, brush with egg, top with cheese and bake in the oven at 200 degrees for 15 minutes. 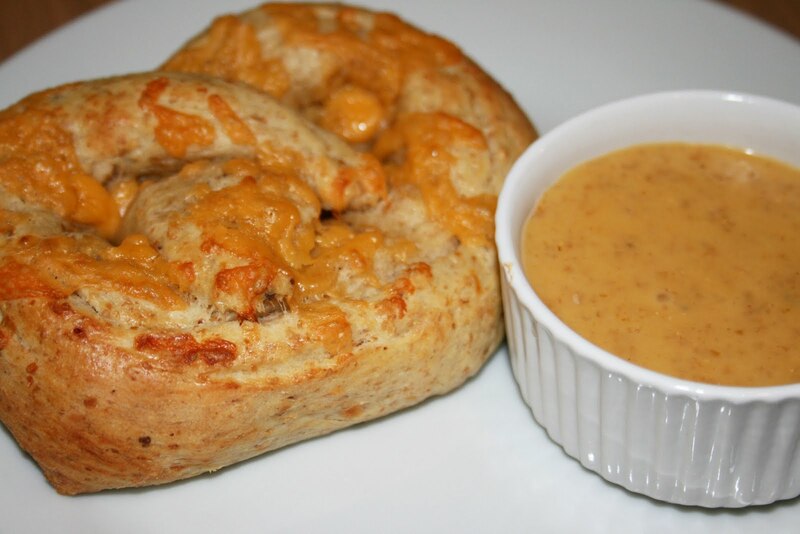 Make up the dip by boiling the cider for 3 minutes, then mixing in the cheese and flour until it forms a smooth dip. Serve the pretzels straight from the oven with the warm dip. Glad you were inspired by my post! Now you have sent the craving back to me with that picture...straight from the oven with the warm dip...YUM!